Por fín puedes tener ese juguete con el que siempre has soñado: las figuras de resina de Pepi y Victoriano, los protagonistas de Cortesía y Neumáticos. 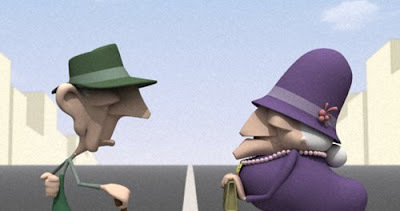 Politeness and Tires from Mayec Rancel on Vimeo. You can finally have that toy which you have always dreamed of: the resin sculptures of Pepi and Victoriano, the main characters from my short-film Politeness & Tires. And of course, feel free to tell all your friends. The more votes, the better. This is a double premiere! For the first time ever, Substantia will be screened as we planned and made it: in High Definition Full-HD. For the first time, festival-goers will be able to see all the work that was put into this shortfilm's details. And it will happen in Los Angeles, California, at HDFest. HDFest will take place in two weeks, on days 5, 6 and 7 December. The High-Definition Animation Showcase, of which Substantia is part, will take place on Sunday 7th December, 2-3:15 pm. Please visit the festival's website where you will find the full program of events and more detailed information. Another FumeFX test. This time Youtube's extreme compression is seriously screwing it up. You can't even see the floating embers particles I put in there, and you can barely see the smoke.